Seduce is a high energy, unique and versatile party band offering the highest quality musical ensembles from duo to 9 piece. Their most popular line up is the 6 piece band which features both lead female and male vocals along with saxophone, and with this they can perform a wide mix of musical styles from jazz and swing, to lounge, pop, soul and even rock.. always keeping up to date with current chart hits. Seduce Party Band is a long established and highly acclaimed covers band… founded in 2005 by vocalist Abi Gilchrist (vocalist for TV and film), the band has performed Internationally for the last 12 years for all sizes and styles of wedding, corporate event and private parties at the most exclusive of venues from The Ritz to Blenheim Palace to the top of a mountain in St Moritz for Gorbachov! 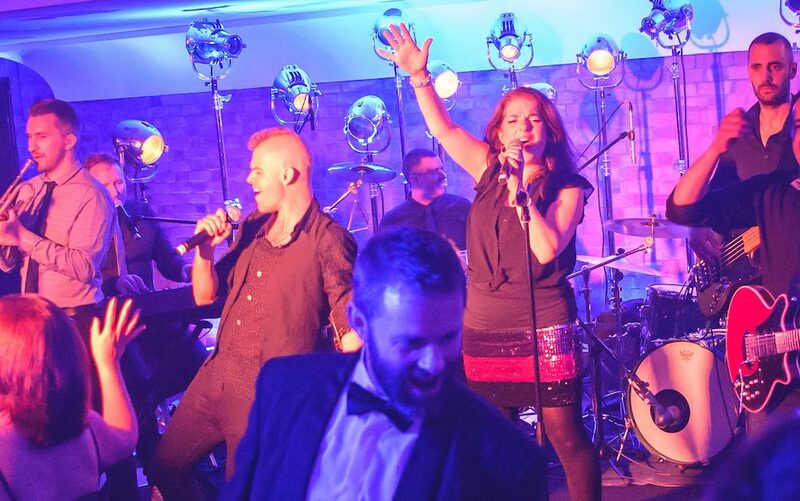 The band are renowned in the music industry as a cut above the rest as proved by being the chosen band for Ronan Keating’s personal 40th birthday party after he saw them perform, and also being asked to perform after a private Status Quo gig…. The bands line up ranges from 4 piece through to 9 piece with full horn section and specialises in the most up to date chart hits along with favourite party classics from the 60’s to today. Seduce Party Band provide a ‘show’ not just a gig…. their originally crafted medleys and mash up’s mean that this is a non stop performance with clever and seamless segues between all the best songs to keep the dance floor full any all times. This high energy party band perform a wide mix of musical styles from up-tempo jazz and swing, to pop, soul and rock. Their most popular line up, the 6 piece Seduce Party Band features both female and male vocals and saxophone (when available) and can reduce to a 4 or 5 piece or extend up to an 8 piece band when a larger sound is required. All your favourite party classics are teamed with contemporary rock and pop numbers. Their regular set list stretches from The Rolling Stones, Jackson 5 & Queen, to Beyonce, Jess Glynne and Bruno Mars. Seduce can also provide a smaller line up from the main band to perform background music for drinks reception or over dinner to keep a live element throughout the event. ​The Seduce Party Band are the perfect all round band for your wedding, corporate event or party.